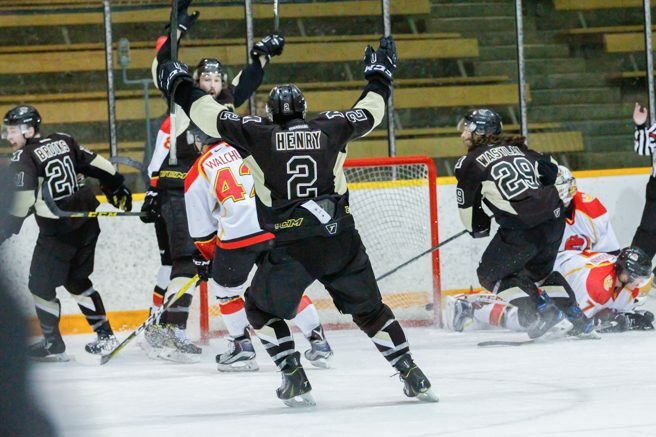 In a key battle for home-ice advantage in the playoffs, the University of Calgary Dinos and the University of Manitoba Bisons took to the ice at the Wayne Fleming Arena this weekend. The Bisons won 4-3 on Friday night but fell 7-6 in overtime on Saturday afternoon. Following their thrashing of the University of Lethbridge Pronghorns last weekend, where the Bisons outscored their opponents 13-3, the herd was back on the ice Friday to take on the Dinos. It was a black and blue affair throughout, but the Bisons came out on top 4-3. The Bisons got on the board first seven minutes into the game with a Brett Brooks goal. Brooks shot from the side of the net, catching Calgary goalie Steven Stanford at an odd angle; he appeared to snag the puck but it snuck by him. Calgary responded moments later on the power play after Brett Stovin took an undisciplined boarding penalty. A mad scramble in front of the Bisons’ net led to a shot from the side. Bison goalie Byron Spriggs got on it but the puck popped behind him and Adam Kambeitz of the Dinos pounced on the loose puck. Manitoba restored their lead when Stovin won the draw back and the puck slid towards the slot. Shaq Merstay stepped into a shot and hammered the puck top corner on Stanford. Defenseman Adam Henry extended the lead near the end of the second frame when the Bisons broke into the Dinos’ zone with a three-on-two. Winger Shawn Bowles sent a cross-ice pass to Henry, who ripped a shot low glove-side on the Calgary netminder. Dylan Walchuk then scored a power play marker for the Dinos. He caught a pass drifting through the left faceoff dot, ripping a shot top corner on Spriggs to make it a 3-2 game. The two-goal Bison lead was restored in the opening moments of the third. Stovin dangled the puck through the legs of two Dinos defenders, getting the puck low to Merasty. The six-foot-five forward centered the puck from the corner to Channing Bresciani, who hit it past the low blocker on Stanford. The Dinos notched a shorthanded goal late in the game but fell to the Bisons 4-3. The final ten minutes of the game were physical, as tempers ran red hot. A barn burner on Saturday afternoon saw the Bisons and Dinos combine for 13 goals, with the Dinos coming out on top 7-6 in overtime. The Dinos drew first blood on Saturday five minutes into the opening frame. Late in the second, former Steinbach Piston Quinton Lisoway tied things up with a short side shot on rookie goaltender Matt Greenfield. The next shift, Stovin split the Dinos defensmen and backhanded a shot over Greenfield’s pad. Walchuk knotted the scores at two 49 seconds into the second after he sniped over Spriggs’s shoulder from the top of the circle. The Dinos reclaimed the lead when Drydn Dow scored his fourth goal of the year on the power play. The Dinos added two more goals in the second to make it 5-2 after 40. After giving up a shorthanded goal, the Bisons were down 6-2 early in the third. Brad Bowles then cut into the Dinos’ lead with a scrappy rebound goal. A couple shifts later, Jordan DePape pounced on a rebound at the side of the net to make it 6-4. Defenseman Blake Heinrich made it 6-5 after firing a short side shot on the rush, forcing the Dinos to call a timeout. Liam Bilton tied the game at six with seven minutes remaining in the game as he showed great patience on the rush. Cain Franson broke Bison hearts with a backhand goal in the second overtime period. The Bisons go on the road to play the league-leading Saskatchewan Huskies on Feb. 3-4.